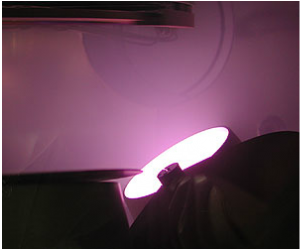 AJA International, Inc. has developed well over 100 different types of magnetron sputtering sources since 1991 including many sources specifically designed for specialty applications. 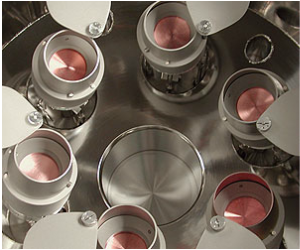 Unique rectangular, circular, turret and cylindrical versions are offered depending on the substrate geometries, chamber configurations, target material constraints and the desired film specification. See further details below or contact AJA about your requirements. This data is for 2" UHV and HV magnetron sputter sources configured in an unbalanced mode for maximum rate, target utilization and film density. 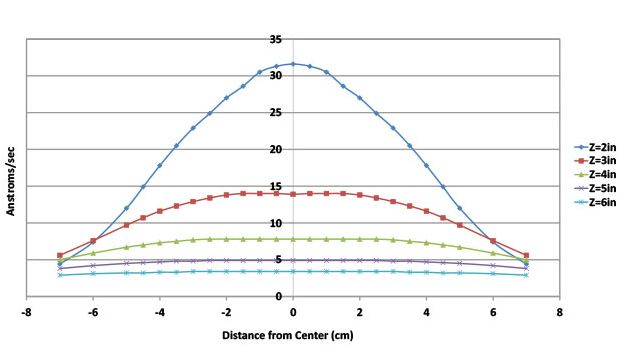 Deposition orientation is direct and shown at different working distances. Operating Pressure was 3.0 mTorr and a Cu target was run at 100 Watts. Uniformity over a 4 cm diameter substrate was +/- 2.9% at 3", +/- 1.9% at 4" and +/- 1.0% at 5". This data is for 3" UHV and HV magnetron sputter sources configured in an unbalanced mode for maximum rate, target utilization and film density. Deposition orientation is direct and shown at different working distances. Operating Pressure was 3.0 mTorr and a Cu target was run at 100 Watts. Uniformity over a 4 cm diameter substrate was +/- 0.7% at 3", and less than +/- 0.1% at 4". Uniformity over an 8 cm diameter substrate was +/- 3.25% at 4", +/- 2.05% at 5" and +/- 1.48" at 6". The data shown above is measured at 3 working distances over the ST2080 in the long direction. The source was tested with a Cu target at 4 mTorr and running at 1400 W (2505 mA, 558 V). 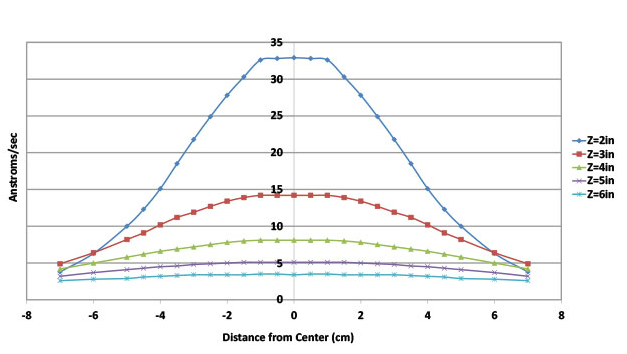 Uniformity over 6" at a 4" working distance is +/- 3.2%. Discharge Voltage as a function is shown for both 2" sources running at 200 W DC power. Shown with 4" Fe target on integral jacking platform for easy target exchange. Custom Configured for Facing Target Deposition with adjustable spacing. On 1.5" OD support for compression seal mounting. 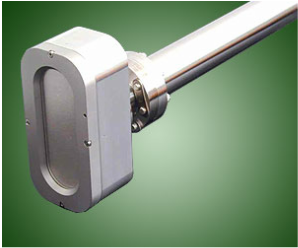 Coating inside tubes can be difficult since most sputter sources are too large and not end mounted. 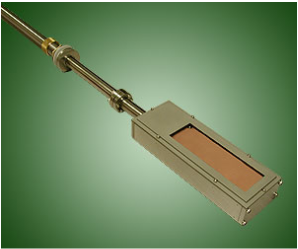 AJA has developed low profile, rectangular magnetrons for 5" and 8" long targets.with long support tubes. 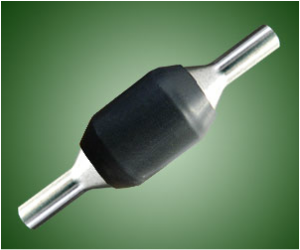 By inserting the source into the end of a rotating, tubular substrate and moving either the source or the substrate in a linear fashion, the inside of the tube can be uniformly coated. AJA also has custom designs for small conical target units for tubes as small as 2" in diameter. 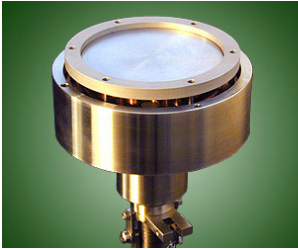 The AJA A300-XP UHV Magnetron Sputtering Sources are the next generation, "expanded performance" version of the industry standard A300 SERIES magnetron sputtering sources that have dominated the high end, UHV sputter gun market since 1991. New "expanded performance" features include higher pressure operation, improved magnetic material sputtering performance, and a larger product range. Although our competitors have attempted to incorporate certain "AJA innovations" into their product lines during the last 10 years, the new A300-XP source developments will continue to ensure AJA's position well ahead of the pack in the UHV magnetron market. 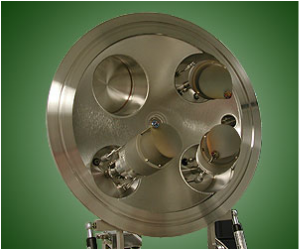 Shown above is a typical A320-XP 2" UHV source with in-situ tilt, pneumatic shutter, gas ring, conical chimney and integral gas injection. 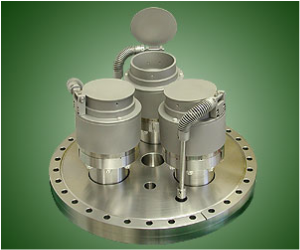 4" Target UHV magnetron sputtering source on 8" CF rotatable flange (bolt ring not shown) with chimney, gas ring and pneumatic shutter. UHV magnetron sputter source with in-situ tilt shown in a con-focal orientation for uniform deposition onto 150 mm Ø substrates. AJA’s unique A310-XP source fits through the port of a 2.75” CF flange. Target changes can be made with one hand either inside or outside of the chamber. This revolutionary design is full ceramic to metal construction. These sources can also be combined into multi-gun clusters. 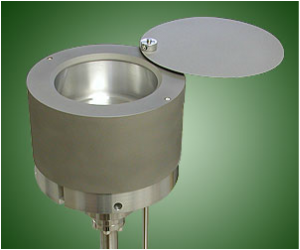 The design is ideal for Surface Science chambers and anyone working with small substrates (up to 2” Ø). The A310-XP is suitable for RF and DC operation. In 1994 AJA was awarded a joint patent with the U.S. Air Force for the CTM (Conical Target Magnetron) designed to provide efficient off axis deposition of HiTC superconductors. Variations have since been created. Most current applications are based on minimizing damage due to high energy ions or neutrals. One particularly interesting application is the deposition of conductive oxides such as ITO for displays. 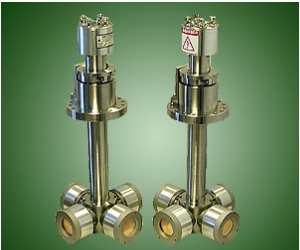 These sources all feature integral process gas distribution and are available in both HV and UHV versions. 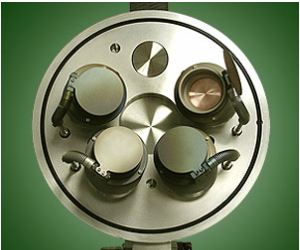 The AJA A3CV series magnetron sputtering sources feature the unique ability to fit multiple target modules onto a common source head subassembly. This flexibility is ideal for R&D applications where the user wishes to sputter various size targets (large magnetic, small precious metal, standard size and custom size) without incurring the cost of multiple sources. 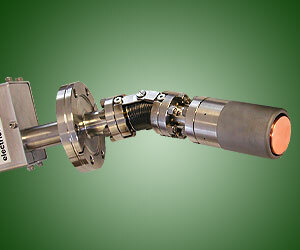 A3CV sources are available in both HV and UHV mounting versions. All sources are RF and DC compatible. Gas injection chimneys, source head tilt gimbals, integral shutters and power supplies are optional. A3CV Series sources also feature the unique AJA “modular magnet array”. Clockwise from far left: 2" version with manual tilt, gas injection chimney, 2.5" version on 6"Cf flange, gas injection chimney showing gas channel, 3" magnetic material version, 2" module, magnetic version core, magnetic version module. 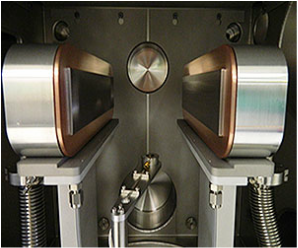 For angled sputtering configurations with rotating substrates, AJA R&D sources are typically fitted with the "in-situ tilt" option. This option, shown above, allows the source angle to be precisely adjusted from outside the vacuum chamber. Fine tuning the incident angle is critical to achieving good deposition uniformity when working distances, operating pressures and materials are changed. 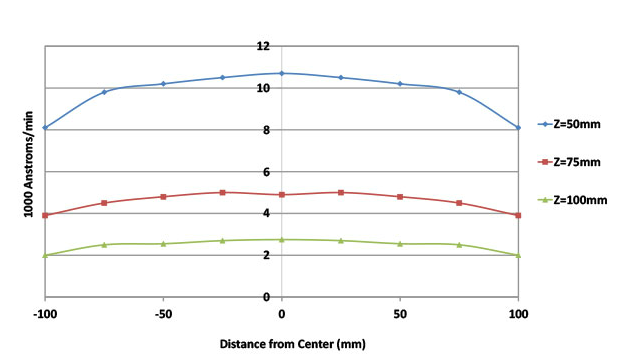 While fixed angle arrangements limit and in some ways compromise the capabilities of a system, "in-situ tilt" can deliver better than +/- 1.5% uniformity on substrates which can be up to triple the diameter of the source targets. 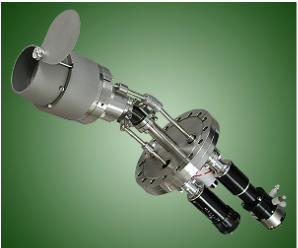 This shows a typical A320-XP 2" UHV source with in-situ tilt, pneumatic shutter, gas ring, conical chimney and integral gas injection. AJA offers conical, cylindrical and high particulate versions of source chimneys. The designs generally incorporate a gas ring in the base of the chimney - sheet injection for smaller sources and individual channels for larger guns. For sources that do not tilt, chimney inserts can be used to enhance uniformity. For ultra low rate doping applications, chimneys can be fitted with grids to reduce rates up to 95%. Surfaces are alumina grit blasted for maximum adhesion. Specialty coatings and water cooled chimneys are available for some applications. 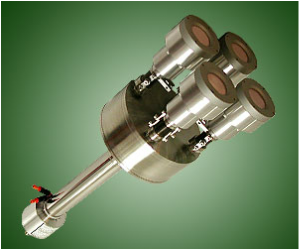 AJA HV and UHV, R&D magnetron sputter sources feature modular magnet arrays which can be converted to operate in balanced, unbalanced and magnetic material modes. A variety of high strength, high temperature rare earth magnet sizes and materials are available to optimize gun performance. A newly developed Super Magnet Puller has been developed to minimize the time required to convert magnet arrays. AJA has developed the perfect quick disconnect for mounting HV magnetron sources with 0.750" Ø support tubes through baseplate holes ranging in size from 1.0" to 34 mm in Ø. 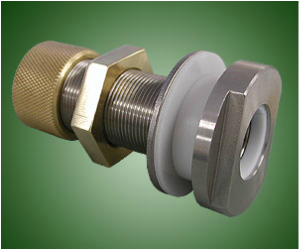 Unlike aluminum BQD's (whose threads are easily stripped) or S/S BQD's (which can easily scratch the support tube), the AJA UBQD uses a stainless body, a PTFE glide ring to protect the tube and an atmosphere side brass nut to prevent galling of the threads. It also includes an adapter ring for 32-34 mm baseplate holes and is economically priced. (2.0" Ø target) and simple substrate rotation. For users building their own system, incorporating an AJA cluster flange with in-situ tilt and an AJA rotating, heated, RF biasable substrate holder, can guarantee proven performance and eliminate design errors which limit system performance and flexibility. 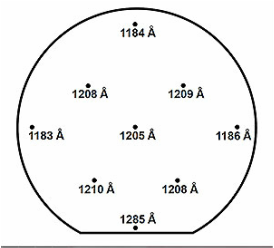 As the world leader in flexible magnetron sputtering source design, AJA also manufactures many varieties of UHV cluster flanges which integrate anywhere from (2) to (12) A300-XP series magnetron sputtering sources onto a single vacuum flange. With the increasing demand for co-deposited thin films of varying stoichiometries and both magnetic and non-magnetic multilayers, AJA cluster flanges offer the most extensive range of possibilities currently available on the market. Sputter down cluster flange with in-situ tilt. Sputter down cluster flange with fixed angle sources and flip shutters. Flange accepts up to (5) 2” sources. In-situ tilt in a con-focal orientation for uniform deposition onto 100 mm Ø.
sources having in-situ tilt and long conical chimneys for operation below 0.5 mTorr. fixed sources fitted with flip shutters. 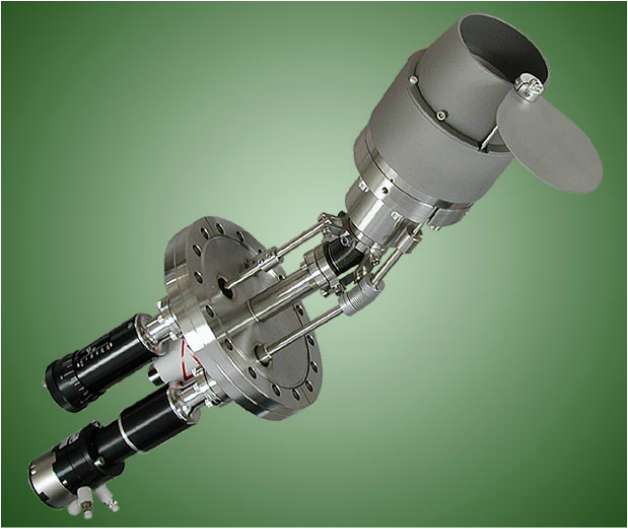 The Axial Turret design locates multiple source heads, oriented axially, on the end of a rotatable support tube running through a hollow shaft, UHV, ferroflluid rotary vacuum feedthrough. The source heads are cooled and powered through the support tube and the assembly is indexed to aim the desired source at the substrate. 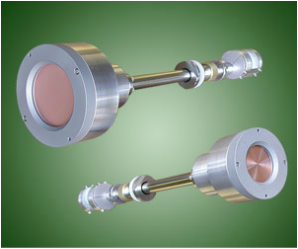 A single port can be used to introduce multiple magnetrons into a deposition chamber. An interesting version shown has tilt gimbals on each source allowing further articulation of the source head. 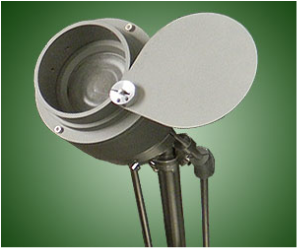 Turrets are available with up to 12 heads. 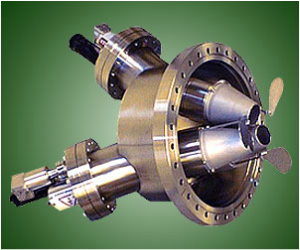 The Radial Turret design locates multiple source heads, oriented radially, on the end of a rotatable support tube running through a hollow shaft, UHV, ferroflluid rotary vacuum feedthrough. The source heads are cooled and powered through the support tube and the assembly is indexed to aim the desired source at the substrate. 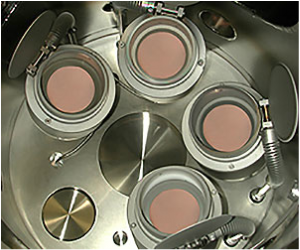 A single port can be used to introduce multiple magnetrons into a deposition chamber. 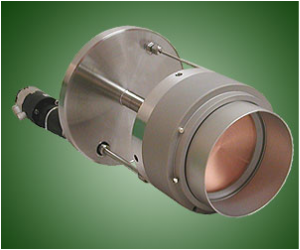 Turrets are available with up to 12 heads and integral RF/DC matchbox/switchbox modules.